UCF received a tough fight from FCS Austin Peay on Saturday evening, but managed to win the shootout 73-33 to remain undefeated on the year. To the surprise of many, the Governors (5-4, 4-1 OVC) kept things interesting all night. They started the evening by going on a 12-play, 75-yard scoring drive in 6:41 to tie the score after a game-opening touchdown for the No. 18 Knights (7-0, 4-0 AAC). After UCF went up 21-7, Austin Peay continued to fight back. Offensive lineman Ryan Rockensuess recovered a goal line fumble from his own team to bring the Governors within eight. However, that was the closest they would get as the Knights’ offense proved to be too much to handle. The teams traded scores throughout a wild second quarter, but UCF put up a late touchdown by sophomore Dredrick Snelson to take a 45-26 lead into halftime. The second half was more of the same. Neither defense took control, even when different quarterbacks entered the game. It was the same story as the first half, though, as Austin Peay just couldn’t keep up with UCF’s offensive firepower. Sophomore McKenzie Milton completed 24 of his 26 passes for 275 yards and three touchdowns in just under three quarters of play. He connected with nine different receivers and added a touchdown on the ground. Snelson had the biggest game of his career, catching five passes for 90 yards and two scores. The 73 points is a new school record for UCF, beating the previous record of 71 set on Sept. 5, 1992 against Gardner Webb. It was an uncharacteristically poor game from the Knights defense. Austin Peay’s 33 points were the most by a UCF opponent this season. 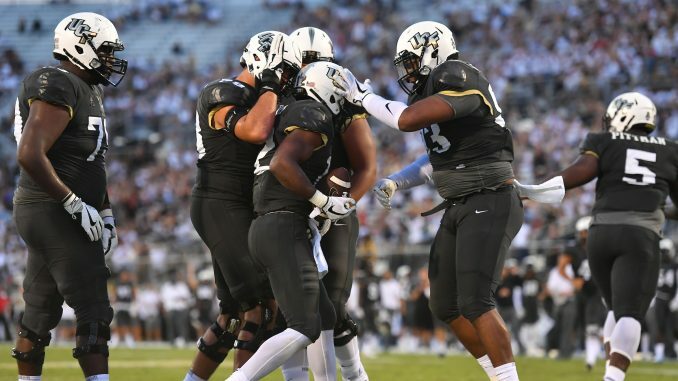 UCF returns to action next Saturday (Nov. 4), facing SMU (6-2, 3-1 AAC) on the road. The game’s kickoff time will be announced in the coming days.